As a result, Johnson said, the federal government is making a greater effort to engage with state and local law enforcement and encourage them to be “vigilant” about what is happening in their communities. Johnson took issue with this description, but acknowledged that community leaders are in the best position to reach out to individuals which might be vulnerable to radicalization. “It has to come from Islamic leaders, who frankly can talk the language better than the federal government can,” he said. The interview took place two days after the military increased security at U.S. bases over concerns about terrorist threats. Authorities are also investigating an attempted attack on a Prophet Muhammad cartoon contest outside of Dallas, Texas for which ISIS has claimed credit. 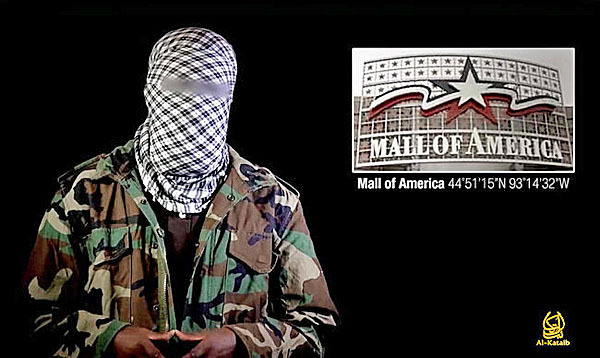 Al-Shabab terrorist on propaganda video seeking to inspire lone-wolf attacks on malls.